The Clwyd Family History Society was founded in 1980 to encourage the study of genealogy and family history in north-east Wales, and to provide a forum for people who are interested in these subjects to meet, and to help each other. It now has approximately 1000 members worldwide. 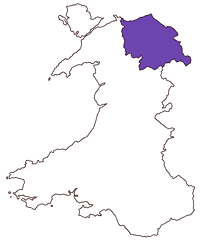 The former county of Clwyd was created in 1974, by merging the historic counties of Flintshire, most of Denbighshire, and the eastern part of Merionethshire. Clwyd was abolished as an administrative county on 31st March 1996; and at the same time, four new unitary authorities came into being - these were named Flintshire, Denbighshire, Wrexham County Borough, and Conwy County Borough. However, the boundaries of the "new" Flintshire and Denbighshire are quite different from those of the historic (pre-1974) counties of the same name. Today Clwyd exists only as a ceremonial county. The hall is off High Street near the lake. Turn off B5445 opposite the Plough Inn.